The French philosophes thought of the individual as being 'prior to' the group. This has been a point of strenuous debate ever since. But whatever the case, individualism is characteristic, in some way, of the whole of our Western society today. I myself am privileged to belong to a society which would seem to have been stranded in time – and while individualism now influences us profoundly, the cultural patterns of the past are still near. This short post serves as an introduction to a concept which is central to my culture in Kiribati: te oi n aomata. Te oi n aomata literally means 'a real or true person'. It includes all people, whether men or women, young or old. This is not merely a living person who has concrete existence, but one who is seen by the community which surrounds him or her to have certain features, whether ascribed or acquired. Therefore it is by these features that a community's recognition of a person is 'weighed': as to whether they are an oi n aomata, 'a real or true person', or not. Since Kiribati society is patriarchal, there is a distinction between how a man (oi ni mwane) and a woman (oi n aine) are seen as oi n aomata. Men will be considered oi n aomata through their material possessions, while women will be known as oi n aomata by their conduct – which is meant in the sense that a woman will be well mannered, respectful, obedient, and so forth. It is rare for a woman to possess or inherit the family’s vital assets such as land, house, taro pit, and canoe. The only exception is a woman who is an only child. Prior to the coming of Europeans to the shores of Kiribati, a man who was regarded as an oi n aomata or oi ni mwane (a real or true man) was 'renowned' as one who came from a good family (which is, a family disciplined in cultural norms), in which he had a good reputation. He would be the first-born or only child, he would have many lands, and he would have a 'house' of his own: not of European design, but a cluster of structures used for meeting, cooking, sleeping, and relaxing. These belongings were very valuable, as they indicated that a man was 'in the community'. In relation to such possessions, a man would further have the skills and the knowledge of how to fish and how to cut toddy, which were vital to the sustenance of his family. He would also know how to build his 'house', and to maintain it. As a man, he was the one who would protect his family from all harm. These were some of the important skills which characterised an oi n mwane or 'real or true man'. He was very highly regarded in communities. Similarly, to be an oi n aomata or oi n aine (a real or true woman), a woman had to come from a good family (again, a family disciplined in cultural norms). 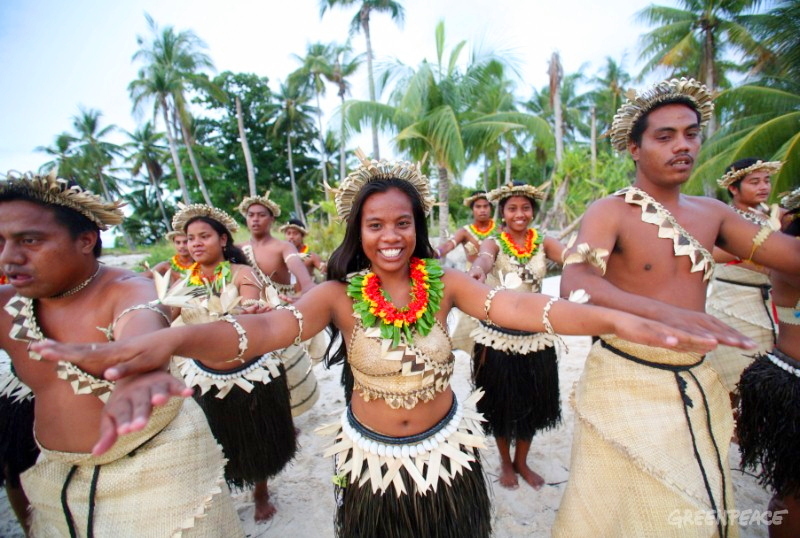 She would be well nurtured and well taught, and she herself would behave according to Kiribati cultural norms. She would know how to cook and to look after her family well. This means that everyone in her household would be served first, while she would be served last. She would know how to weave mats, so that her family would have something to lie on. She would know respect and not talk back, especially to her husband, her in-laws, and elders. Crucially, a woman would remain a virgin until she was married, since this involved the pride of her family. Therefore, she would give no appearance of indiscreet or suspect behaviour. A woman had to maintain her place within the home, and look after her family well. As such she was considered an oi n aine or 'real and true woman', since she was the backbone of her family. Today when one speaks about people, there is a saying, 'Ai tiaki te aomata raom anne,' which refers to those who are 'no longer an (ordinary) person'. Rather, they have acquired, inherited, and possessed important things in the context of our culture, which make life much more enjoyable, much easier, and much better for all (with less complications, and less suffering). However, where globalisation is now at the shores of Kiribati, the definition of an oi n aomata, 'a real or true person', is evolving in relation to changing patterns, norms, and life-styles of the Kiribati people. We see now the effects of these changing patterns – from a communal life to a more individualistic life-style. While this has brought various benefits to society, in many ways it has not been for the better. You’ve offered us, Bereniki, an enlightening glimpse into globalisation’s early influence on your home of Kiribati. Globalisation has indeed reached the Central Pacific! It sounds, from the intimate perspective you’ve shared here, that the influences on Kiribati to date are mostly along sociocultural lines. Though maybe there’s more to it than that. One (obvious) side note, if I may: Your essay, posted gratis the Internet on Pi’s globally accessible site, underscores globalisation’s reach. If you’re interested in a discussion of globalisation, beyond just sociocultural dimensions, you’re invited to go here (full disclosure: my article) . . . I'm reminded of something that struck me a long time ago about liberalism: that it celebrates individualism while praising and relying on public-spiritedness.